Time for another 100 Stitches post. This beautiful stitch is the Back Stitch. I love doing this stitch and use it all the time. 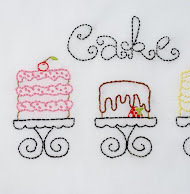 It is a very nice stitch to use for outlining. When I got to the end of the stitching line, I secured my thread on on the underside of the fabric by running my needle under a few of the stitches. The back stitch is number seven on the list of 100 Stitches and is found in the Flat Stitches category. 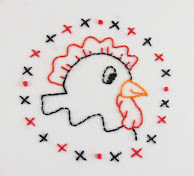 I like back stitch as well, its a very useful stitch. Summer - It is! I use it all the time. Yep, I agree with you all, it is a great stitch to know and use. I like it for outlining, too. Hi Kim! I love this stitch and its simplicity! So well explained, thanks!